Barry Sanders, Lem Barney, and Billy Sims all spent their entire NFL careers with the Detroit Lions and wore the number 20 jersey. Sanders, a Pro Football Hall of Fame running back, is the third leading rusher in NFL history and holds ten Detroit Lions team recrods. He also holds the NFL record for most 1,500-yard seasons, and finished his career with 15,269 rushing yards. Barney, a Hall of Fame cornerback, was a 7x Pro Bowl and All-Pro selection. He had 56 career interceptions and in 1999 was ranked number 97 on The Sporting News' list of the 100 Greatest Football Players. Sims was selected as the first overall pick by the Lions in the 1980 NFL Draft, and would go on to lead the team to the 1982 and 1983 playoffs. He was a 3x Pro Bowl selection and was named Offensive Rookie of the Year in 1980. These Detroit Lions 16x20 photos have been hand signed by legends Barry Sanders, Lem Barney, and Billy Sims. 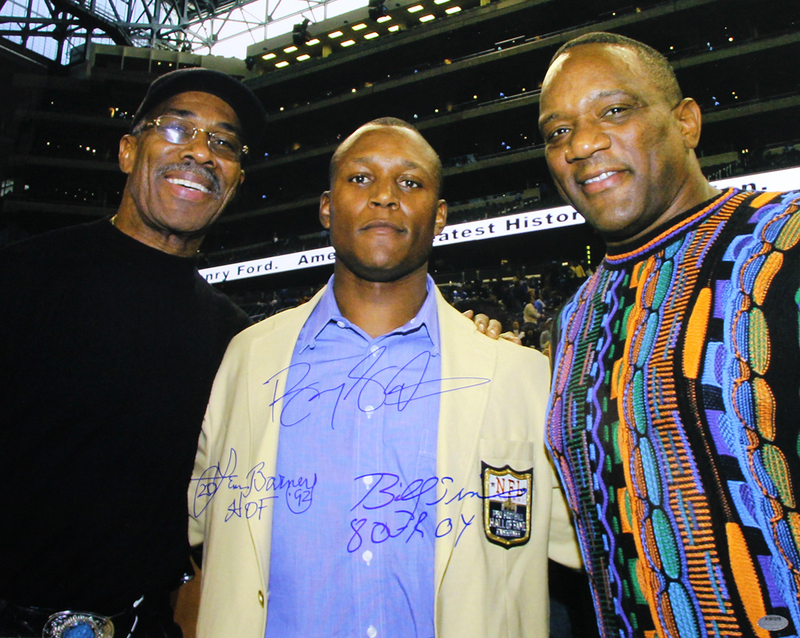 Lem Barney included "HOF 92" with his signature, and Billy Sims inscribed "80 ROY". Each autograph is guaranteed authentic, and includes an individually numbered TRISTAR authentic hologram.